Well that's one way to avoid the 5p plastic bag charge! We all know someone who refuses to pay the 5p charge for bags at supermarkets. 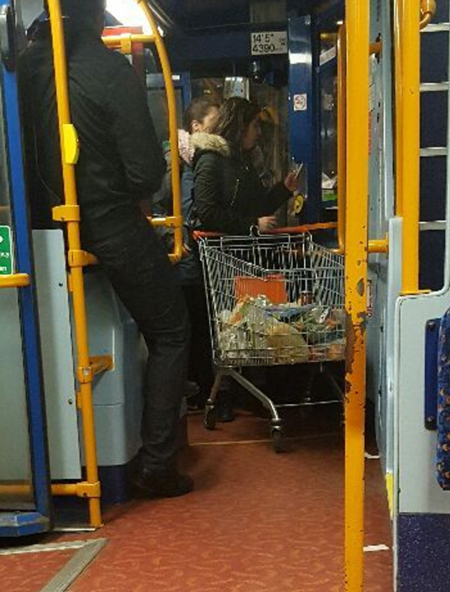 But in 2016, its safe to assume that most people do not go as far as taking their trolleys home... not unless they're willing to lose their £1 depostit and their dignity, anyway. One woman, however, proved herself to be an absolute renegade by not only flouting the rules regarding trolleys, but attempting to board a London bus with it too! Because the driver is definitely going to just let that massive trolley slide isn't he? And just in case that's not weird enough for you, take a moment to check out the guy on the left hand of the photo, who has his foot in the luggage section!